Internships are helpful for students who want a hands-on learning experience in a real TV or radio station. Interning with a broadcaster can help you narrow down what kind of job you’d like to do in the field. It’s also an asset to your resume when you’re ready to apply for jobs after graduation. First of all, start looking sooner rather than later. If you’re hoping for a summer internship, it’s best to start looking early in the spring semester, or even the previous fall. Many summer internships have application deadlines in February or March. Please note that the days of work-for-free interns are gone. Due to a recent lawsuit and subsequent court decisions, interns must either be paid or receive academic credit. Some schools allow students to get class credit for doing an internship during a semester, usually with an approved local company, but you’ll also need to apply for those months in advance. Several websites dedicated to helping students find internships in their field allow you to search for journalism openings. Many schools maintain a list of resources for students seeking internships. You can also check with local broadcasters in your area—some may list these positions on their “job opportunities” page. The application process often varies from one broadcaster to another, so it’s important to read the requirements carefully and make sure you’ve met all of them before clicking the “submit” icon. Some may want a video audition explaining why you’d make a great intern, while others may ask for samples of packages you’ve produced in class. Regardless of other requirements, most companies want a resume and cover letter. If you haven’t written a resume yet, now is a good time to start—it’s definitely better than waiting until you graduate and start applying for jobs. If you have written a resume, this is a good time to update it. In general, a resume should have your name and contact info at the top, then subheadings for education, work experience, and possibly volunteer work or student associations. If a student is responding to a posting, it’s always advisable to integrate some of the language from the posting into the cover letter. They have provided a checklist of what they are looking for, so you give them their own words back. This is especially helpful in an era when, at large companies, software often scans incoming job applications and selects only some of them to be forwarded on to a real person. You should list any work experience you have, even if it’s not related to broadcast journalism. The fact that you worked at Joe’s Hamburger Barn the last three summers suggests you were a reliable and hard-working employee—otherwise, Joe probably would have hired someone else instead of hiring you back for the next summer. A cover letter should do three things: It should tell the reader who you are, why you want the internship, and what you can do for the company. Although you may repeat some sentences or paragraphs about your education, experience, and goals, you should not send the exact same letter to every company. First, address your letter to the correct individual. Usually applications list a contact person. If not, search the organization’s website—you may find an “internship coordinator” or “hiring manger” listed in the directory. If that doesn’t work, simply call the company and ask for the name of the person in charge of the internship program. The next paragraph should tell more about your education and work history, especially any broadcast journalism-related experience. Your final paragraph should mention that you’ve attached your resume (and any other requested materials). Close by thanking the recipients for their time and note that you look forward to hearing from them. Even if you’re a great candidate, you will be vying with hundreds of other applicants for each internship. For that reason, you should apply for as many as you can to improve your chances of landing one. There’s no reason to stick with your city, either. 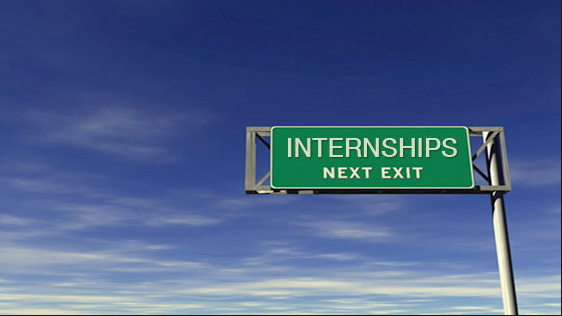 You can apply for internships all over the country. Keep in mind, however, that some internships are unpaid. Some larger companies may provide housing for a pool of interns, but most will expect you to pay your own expenses. Even a paid internship might not pay enough for all your expenses while living in an unfamiliar city. If traveling and renting an apartment out of town isn’t financially feasible, you might want to focus on an internship closer to home—even if it doesn’t pay at all. Or, you could look for one in a city where you could stay with a friend or relative. Obviously, most students would rather take a paid internship—which is probably why there’s even more competition for these spots. There’s nothing wrong with trying to land one, but in case that doesn’t work out, you can at least get academic credit if your school allows it. And while you might not make any money, you will learn about the different job roles in a TV or radio station. If you’re unsure which career path you want to follow, working at a TV or radio station might help you figure out which position most interests you. Also, you get to network and make contacts, which can help when you graduate and start looking for a job in broadcast journalism.